… not even a note goodbye. Today, my wife needed to be in the city for work, so after dropping her off at the train station, I stopped for a bagel at my normal spot, Bagels-4-U of Denville. They usually open at 5:30 and by now it was about 7 am, so when I found the doors locked and the lights off, I was surprised. Then I noticed that the window signs had been taken down and that there was a step ladder visible inside… Not a good sign. 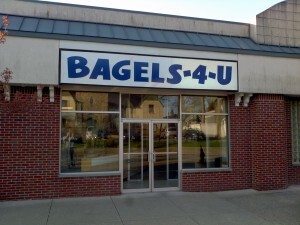 A quick call to the Bagels-4-U headquarters and discussion with the man who answered revealed that the Denville location has indeed been closed due to lack of business, and that the last day was this past Sunday, April 21, 2013. I told him how much they would be missed and wished them success with the other locations. In my opinion, they had the best bagels in town… hand rolled, perfect New York style with a great crust. You used to be able to see them being made with care in the giant kettle and oven right when you walked into the place. I don’t know where I am going to go for my bagels now; all of the other bagel shops in town I have tried are lacking in comparison. 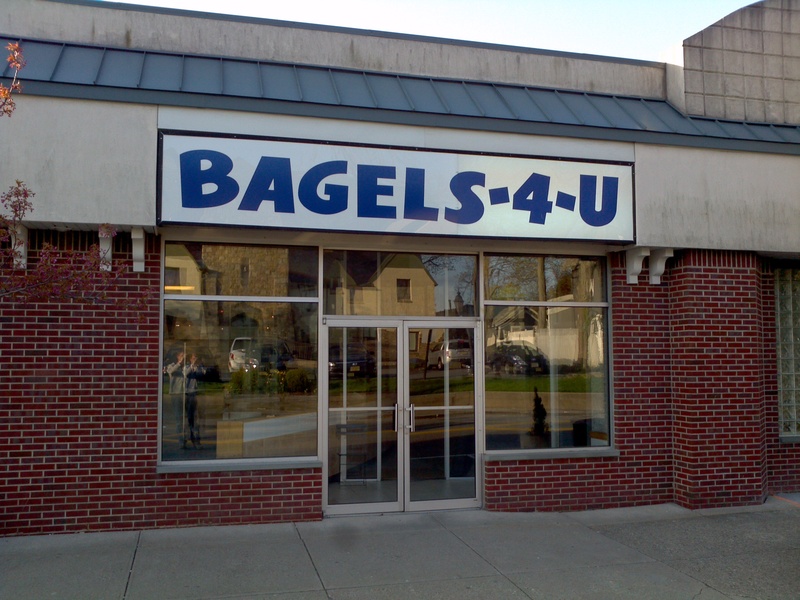 Bagels-4-U does have a number of other locations throughout New Jersey, so if you use one of the other ones, make sure to give them some extra lovin’ this month. This really ruined my morning. Support your local small businesses! Stopping here in the morning before work actually made me look forward to getting up early, and I was never a morning person. They will definitely be missed!! So very sad. They were a Sunday morning staple since our first son was born. We had our favorite table and had our routine down to a science. They truly made the best bagels in town. My kids will miss waving to the nice bagel man! “Support your local small businesses” – this is so through; it employs people and keeps people busy in their own neighborhood. Without having to go to the city for the bigger stores etc. Also in the Netherlands this applies. I understood what you meant… In fact, your English is better than many people in my own country, so don’t worry about it, George! Also – thanks for the comment from the Netherlands, you’re the first person to leave one from there that I know of!